COCONARA COCONUT CHARCOAL SUPPLIES FOR HOOKAHS – 120pc Non-quick light shisha coals for hookah pipes. All-natural coal accessories & parts that are Tasteless, Odorless, & Chemical-free. CocoNara is one of the many brands of non-quick light coconut charcoal on the market making supplies for your hookahs. Manufactured in Indonesia, CocoNara Coconut Charcoals in the 120pc box are compressed into individual rectangles so they do not leave a lot of ash and to prevent the charcoal from rolling off the top of your hookah Bowl. CocoNara Shisha Coals are all-natural and do not contain any quick light chemicals and therefore require an electric burner or open flame to light properly. Being primarily used by either avid smokers of hookah pipes or Hookah Lounges, these accessories and parts are specifically designed for Hookah smoking as they are odorless, tasteless, and chemical-free. You can expect approximately 40-50 minutes of burn time per coal since these burn three times longer than most other Charcoals on the market. 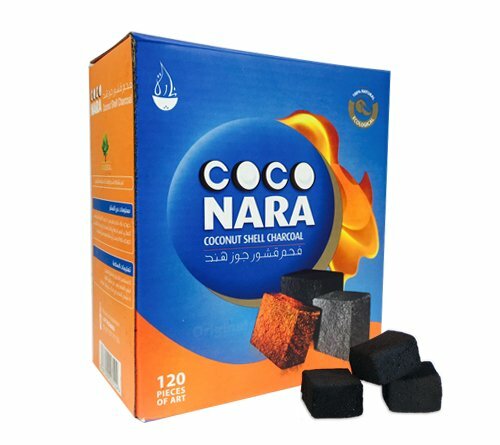 CocoNara Coconut charcoal comes in a 120pc box. These are Non-Quick Light shisha coals for hookah pipes that require a burner to light. CocoNara supplies your hookahs with 40-50 minutes of burn time per coal. These all-natural accessories and parts are Tasteless, Odorless, & Chemical-free. CocoNara manufactures their product in Indonesia. If you have any questions about this product by CocoNara, contact us by completing and submitting the form below. If you are looking for a specif part number, please include it with your message.